Megalodon, The Worlds Largest Predator? Carcharodon Megalodon has to be the biggest fish story of all time. He was this big! (----------------) No, really! Initial estimates of this giant shark were 80 to 100 feet in length! Well ok, he was this big. (---------) More recent estimates figure him to be 40 to 50 feet long and weighing 48 tons! This is still unbelievably huge. That’s longer than my house! The weight is comparable to 7 large African elephants weighing 7 tons each! That’s bigger than T-Rex! In fact next to the sperm whale Megalodon was the largest predator the world has ever seen! What’s For Dinner?This ancient shark had no equal in the ocean and certainly nothing preyed upon it. Providing nourishment for 48 tons of raw powered muscle is no slight task. They probably dined on whales. Carcharodon Megalodon was a giant shark that lived during the Miocene and Pliocene epochs of the Cenozoic Era, between 2 million and 16 million years ago. 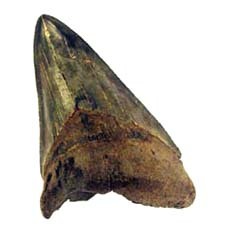 Little is known for sure about these giant predators because all that remains of their existence are fossilized teeth. But what teeth they are! These giant shark teeth range in size from 3 inches long to 7 inches long. They are massive things that can be bigger than a man’s hand. It sets the imagination reeling. To put this in perspective a large great white shark measures about 20 feet long and weighs a little over 2 tons. A tooth from a shark like this is about 1.5 inches long. The fossilized teeth are all that remains of this monster because sharks do not have bones. Their skeleton is made up of cartilage. This is what your ears and nose are made from. Cartilage does not fossilize well. Is megalodon related to the Great White Shark?